Joy Spillis Lundeen is 'the reputed 'go-to' person for all things construction. Lundeen joins the rankings with a chorus of praise for her depth of knowledge in construction defects as well as her courtroom dynamism and ability to communicate with a jury. Joy Spillis Lundeen leads the Construction Law Practice Group and serves as a member of the Firm's Board of Directors. A trial lawyer with three decades of experience in jury and non-jury trials, Ms. Lundeen has trial experience in federal and state courts, arbitration, and in the use of mediation for resolution of complex disputes. Her practice focuses on construction litigation, product liability, and a wide range of complex business and tort cases, including class actions. Ms. Lundeen also counsels owners and developers in all areas related to the design and construction of real estate development, including contract negotiations, insurance for construction projects and design service agreements. Lead counsel for Brightline Trains, LLC (f/k/a All Aboard Florida) in disputes arising from the delayed construction of the new high-speed train project, including a $25 million claim brought by the structural steel fabricator and erector for the downtown Miami station. Litigation is pending. Lead counsel for the South Florida Stadium, LLC, (“SFS”), an affiliate of the owner of the Miami Dolphins professional football team, in a lawsuit arising out of a $110 million change order submitted for the fabrication and erection of the rooftop shade canopy over the Hard Rock Stadium. Litigation is pending. Secured a $22.5 million settlement as co-lead counsel for the owners of a 676-unit condominium community in a construction defects lawsuit reported as one of the largest in Palm Beach County history. Kolter Homes and more than a dozen other subcontractors settled on the third day of jury selection, following three successive verdicts for the owners in court-conducted mock jury trials. Lead counsel for prevailing party in a month-long jury trial, resulting in a seven-figure verdict on a case widely noted for the trial team’s success in exposing the fraudulent conduct perpetrated by an unlicensed engineer. Lead counsel in a month-long opt-out jury trial for global building products manufacturer Knauf in defense of claims for defective drywall imported from China to the U.S.
Lead class counsel in the first reported class action certification for “sick building” residents of high-rise beachfront project, triggering a settlement for the class valued at $65 million. Secured favorable settlement as lead counsel for The Related Group of Florida and its affiliates in litigation against one of the nation’s largest commercial builders involving construction delays and defects in a 1000-unit luxury condominium. Obtained a multi-million dollar jury verdict as lead counsel for construction firm following two-week jury trial against luxury high-rise condominium in Sunny Isles, Florida. Negotiated construction contract for joint venture developer of Mary Brickell Village luxury high-rise mixed-use building containing 390 residential units and recreational and other commonly used facilities. Prevailed on a multi-million dollar verdict as co-lead counsel for the world’s leading distributor of aerospace fasteners following a month-long bench trial involving competing claims for defects and delay in the construction of the company’s headquarters. Lead counsel for developers of a 10-building affordable housing complex in prosecution of Hurricane Wilma windstorm damage claims against a world leading insurance syndicator and numerous contractors; coordinated a complex mold remediation plan, tenant relocation, and construction repairs, and secured a multimillion dollar settlement. Lead counsel for one of the region’s largest homebuilders in defense of several class-action claims by thousands of homeowners for hurricane induced water intrusion damages, implementing a complex repair and remediation plan for affected homeowners and securing favorable settlements. Lead counsel for the developer of a distressed downtown Miami high-rise condominium in the closeout of all construction liens, loan restructuring and release of guarantee on a $140 million syndicated loan agreement. 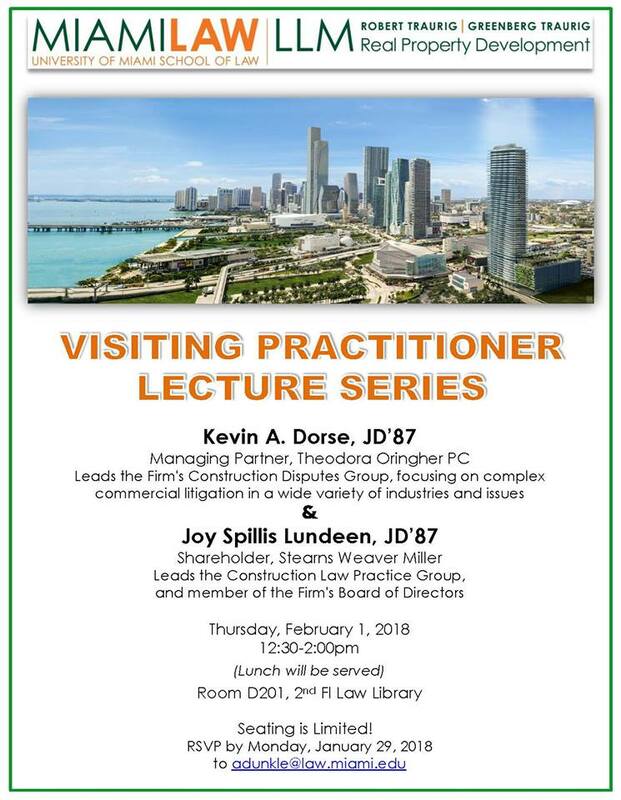 Secured a favorable settlement as co-lead counsel for Donald and Lisa Pliner in litigation brought to recover for construction and design defects against the architect, contractor and subcontractors of their Star Island, Miami Beach home. Represented international developer, Jorge M. Perez, against Pozzi Window Company, recovering complete replacement and other damages for defectively installed and manufactured hurricane impact windows in the client’s South Florida home. Obtained a favorable settlement as lead counsel for The Related Group of Florida and its affiliates in a $15 million construction delay and completion claim brought against the contractor of a 500-unit condominium complex in downtown Miami. Co-lead counsel for one of the nation’s most important libel cases against a prime-time network news magazine. Lead counsel for developers and owners of a 12-building affordable housing complex in Tampa, Florida, in prosecution of claims against the general contractor, successfully settling the case on the eve of trial, following coordination of mold remediation, tenant relocation, and construction repairs. Lead counsel for developer of Brickell World Plaza, in construction litigation against general contractor, John Moriarty & Associates of Florida, in suit alleging construction defects, nonpayment and completion delays. Favorably resolved a $5,000,000 million construction and design defect claim brought against the developer of a 67-unit ultra-luxury South Beach condominium. Represented developer of a 600-unit luxury condominium in downtown Miami in the defense of a $15 million construction defect claim by two condominium associations and a homeowner’s association. Favorably resolved a $3,000,000 construction and design defect claim brought against the developer of a 308-unit ultra-luxury condominium located in Fort Lauderdale Beach. Favorably resolved a $4,000,000 construction and design defect lawsuit brought against the developer of a 197-unit luxury condominium located in West Palm Beach, Florida. Favorably resolved a $5,000,000 construction and design defect claim brought against the developer of a 500-unit condominium located in Aventura, Florida. Favorably resolved a $2,000,000 construction and design defect claim brought against the developer of a 386-unit luxury condominium located in Hallandale Beach, Florida. Favorably resolved $2,000,000 construction and design defect claim brought against the Developer of a 500-unit loft style condominium located in downtown Miami. Publications: Recovering from Hurricanes Irma and Maria | How can we help?